Mark Miller's Cooking Techniques: rehydrating dried chiles, roasting fresh chiles, toasting nuts, etc. The Sanskrit word for Mango means "of the people", which derives from the important role the mango plays in every day life. A valuable cultivated food source, a refreshing beverage, the mango is a reoccurring thread in the culture, religion and lifestyle of the region of its origin; southern Asia, especially India, Burma and the Andaman Islands. Very good with chicken and curries. 1) Combine vinegar and sugar in heavy bottomed, large kettle or pot. 4) Let simmer about 2 hours with frequent stirring. Contents should thicken in this time. 5) Store as you wish. NOTE: This is good for preserving in sterile jars if you posses the knowledge to do so safely! From Ming Tsai of Blue Ginger fame. Choose mangos that smell fragrant and sweet. Color is not a reliable guide; green mangos can be perfectly ripe. The mango should yield to the touch. In a large, nonreactive bowl, combine the mangos, onions, jalapeños, ginger, sambal, and lime juice, and blend gently. Serve as a salsa or to accompany Jody Adams' Grilled Head-on Shrimp with Macadamia-spice and Ming's Spicy Mango Salsa with Ming Tsai. Maddie and Young Bruce's Shrimp Fajitas served Wed March 10, 2010 featured this side dish. 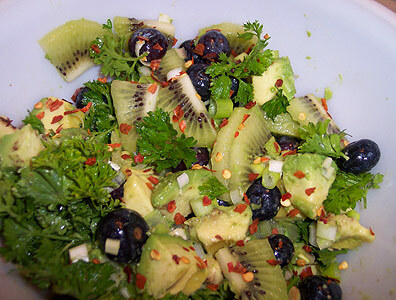 Combine the mango, cucumber, jalapeño, red onion, lime juice and cilantro leaves and mix well. Season with salt and pepper, to taste. Literally means "Drunkards Sauce" and is made from pasilla chiles, beer and orange juice and is typically a sauce very dark in color due to the chiles which are used. These same chiles are often refereed to as "Chiles Negros" and "Black Chiles". Toast chiles on a griddle until slightly charred and skin is blistered. Cut them open and remove seeds and veins and tear or cut into strips. Soak them for 20 minutes in the beer. Now grind or puree the chiles with the beer, orange juice, salt and garlic. Chop the olives coarsely and finely dice the onions. Crumble the mild white cheese. Add the onion, cheese and olives to the puree you made in step 2 and mix well to complete the sauce. When serving garnish the sauce with some of the crumbled white cheese and chopped olives. Great with shredded pork tacos! In a blender or food processor, puree the tomatillos, pineapple juice, vinegar, garlic, chiles, cilantro, cumin seeds, and lime juice. 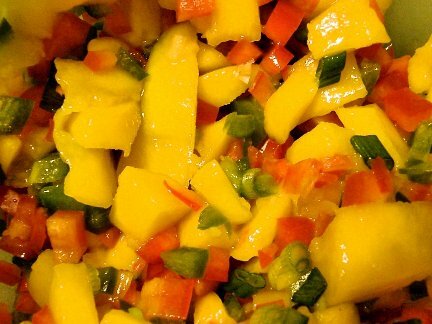 Place the mangos, onions, and bell peppers in a medium bowl, add the puree, and mix well. This salsa will keep, covered and refrigerated, 4 to 5 days. Place all ingredients in a food processor or blender, and puree. Serve with tortilla chips, most seafood and eggs. Tomatillo Avocado Salsa same recipe as above except add 1 avocado roughly chopped and omit the sugar. Cut the tomato in half crosswise; remove the seeds and strain, reserving 2 tablespoons of juice. Dice the tomato; then combine reserved juice and tomato in a bowl, and set aside. Cut bell pepper in half lengthwise, and discard seeds and membranes of 1 half; reserve remaining half for another use. Place bell pepper half, skin side up, on a foil-lined baking sheet, and flatten pepper with palm of hand. Broil 3 inches from heat for 10 minutes or until blackened and charred. Place in a zip-top heavy-duty plastic bag, and seal; let stand for 15 minutes. Peel and discard skin; dice bell pepper. Add bell pepper, mango, and the next 6 ingredients to tomato mixture, and stir well. Yield: 2 cups (serving size: 1/4 cup). Sweet and picante at the same time. Very good with cold roasted meats, chicken or toasted tortillas. A classic Tex-Mex favorite. 1) Prepare the chiles and peppers. Cut open and remove the seeds and veins. If you want to leave a few Jalapeño and Bell pepper seeds in to garnish the jelly it will also give it a bit more bite. Mince the Jalapeños and Green peppers until finely chopped. 2) Place chile-pepper mince into a heavy bottomed, 4 quart saucepan, with the vinegar and sugar. Bring to a boil and lower heat and be sure to skim/remove the foam from the top. It is important to stir to dissolve the sugar when bringing this to the boil. Simmer for 10 minutes. 3) Stir in the pectin and optional food color and simmer for 1 minute longer. Remove from heat and let stand 15 minutes to cool. If you know how to "Can It" then you can preserve this jelly in sterilized jars. NOTE The variations to this jelly are almost without limit. You can add tiny pieces of bell pepper or prepare it with red Jalapeños instead of green Jalapeños. A few leaves of very fresh Cilantro is also an interesting addition ; this should be added as the jelly is cooling down. Combine all ingredients in a bowl. Cover and chill before serving. This fruit salsa goes beautifully with any firm-fleshed fish, or it can be a nice side salad on its own. It doesn’t keep well, so just before serving. Mix all ingredients together, toss lightly and serve with fish. Place the onion in a strainer, rinse with hot water, and drain. Thoroughly combine all the ingredients in a mixing bowl. Add a little more sugar if the tomatoes are acidic, but make sure the salsa does not taste of sugar. Chill in the refrigerator for at least 30 minutes before serving to allow the flavors to combine. 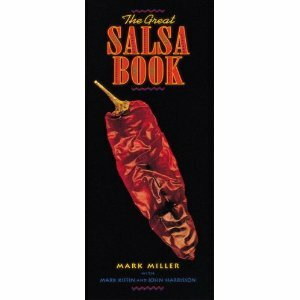 Serving suggestions: An all-purpose salsa; especially good with tortilla chips or grilled meats. Serve with tortilla chips or chicken. Thoroughly combine all the ingredients together in a mixing bowl. *Chipotle chili puree Made from canned chipotle chiles en adobo. of the adobo sauce in which the chiles are packed. Thoroughly combine all ingredients in mixing bowl. Allow to set at room temperature for 1 hour before serving. Variations: Add one tablespoon balsamic vinegar for a tarter flavor. Serve with pasta, fish, on grilled bruschetta or pizza. chiles. Add the tomato, garlic, and salt, then puree. Heat a tablespoon of oil in a saute pan over medium heat until lightly smoking, add the onion and saute until carmelized, about 10 minutes or so. Transfer the onion, half the blackened tomatoes and garlic to a food processor and pulse until finely chopped but not pureed. Add the cilantro and chipotle chiles and pulse again to mix. Peel, seed and chop the remaining tomatoes tomatoes and fold in along with the remaining oil, vinegar, salt and sugar. Serve chilled or at room temp with chips, red meat or chicken. Variation Substitute husked, rinsed and blackened tomatillos for the tomatos. Combine all ingredients in a medium bowl; cover and chill. Thoroughly combine all ingredients together in a mixing bowl. As a summer appetizer, a dessert salsa with whipped cream or mascarpone, or with pork. Brush the mushrooms with 1 tablespoon of the oil and grill until tender. Cut into 1/4-inch dice and transfer to a mixing bowl. Heat another tablespoon of oil in a skillet and saute the onion for 5 minutes over medium heat. Cut the blackened tomatoes in half and squeeze out and discard the seeds and juice. Chop and add to the mixing bowl. Add the remaining tablespoon of olive oil and the remaining ingredients and combine thoroughly. cooked which is one of the classic taste motifs of Southwestern cuisine. Toast the chiles and rehydrate them in 2 cups of warm water (page 144). Drain the chiles, reserving 1/2 cup of the water. Devein the chiles and transfer to a blender. If it is not bitter, add the reserved chile water; otherwise, add 1/2 cup plain water. Sauté the onion in the oil for 5 minutes over medium heat, and add to the chiles. Add the garlic, tomatoes, cumin, oregano, salt, and beer, and blend until puréed. Transfer to a serving bowl and sprinkle the cheese over the top. In Spanish, borracha means "drunk"; this recipe owes its titel to the inclusion of a bottle of beer. True pasilla chiles are dried chilaca chiles. Fresh poblanos are oftenly mistakenly labeled as pasillas, so double-check before buying. Cut the corn kernels from the cobs with a sharp knife (about 3 cups). Heat a large, heavy-bottomed sauté pan or skillet over high heat until almost smoking. Place no more than two layers of the corn kernels in the pan at a time, and dry-roast for 4 to 5 minutes until smoky and dark, tossing continuously. Sauté the mushrooms in 1/2 teaspoon of the olive oil until they are cooked well, about 10 minutes. Transfer to a mixing bowl, add the corn, remaining olive oil, and the rest of the ingredients, and thoroughly combine. Note: If fresh wild mushrooms aren't available, use a combination of dried wild and fresh domestic mushrooms. Serving suggestions: This is a very versatile salsa; especially good with chicken, grilled steak, or as a side dish. Cut pineapple into slices no more than 1/4 inch thick. Cut each slice in half. Dry saute the pineapple slices in a skillet for 8 minutes or so. You want it to be caramelized and golden brown, be careful not to use too high a heat. When cooked, dice and transfer to a mixing bowl. Stir in the remaining ingredients and taste to see if you need more lime juice or chile puree. Serve. Bring large pot of water to boil, add sugar and salt and blanch sweet potatoes for 4 minutes. Drain sweet potatoes in sieve or strainer and shock them under cold running water. Transfer to mixing bowl and add pecans. Rehydrate cranberries in enough hot water to cover for 5 minutes. Drain and add to mixing bowl. In saucepan, cook maple syrup, chile powder and 1/4 cup water together about 4 minutes over medium heat or until liquid is reduced by half. Let cool, add to mixing bowl with orange juice and thoroughly combine. Serving suggestions: with turkey, ham or squab. In general, the only equipment you'll need is a sharp knife, a cutting board, a blender, a food processor, and grater. If possible, invest in a Japanese grater. Always choose the freshest and ripest of ingredients. They may cost more, but they'll have the truest flavors. But fruit and vegetables that are heavy for their size and that look good (if it looks or feels crisp and crunchy, it probably will be), then use them as soon as possible. Never use limp ingredients. Avoid dusty or faded spices. Use fresh herbs: Preferably grow them yourself, in a window box, if need be. Use good-quality oils and vinegars and use up oils within a few months or they will deteriorate with age. Using vinegars or the natural acids in citrus fruit juices for flavor enhancement reduces the amount of salt and sugar you'll need. Use raw, unrefined sugar instead of granulated sugar when possible. Whenever appropriate, cut the different ingredients in a salsa to the same size. Usually, the smaller they're cut, the more interesting the salsa will be. Each spoonful should contain a little of all the ingredients. Fresh fruit salsas tend to be the most fragile and should be used as quickly as possible. Allow all other salsas to sit for 30 minutes or longer before use so the flavor marry and any "sharp corners" get rounded out. Blackening gives tomatoes and tomatillos a more rustic, robust and complex flavor. Remove the stems (tomatillos should also be husked and rinsed) and place on a rack under a broiler or over a gas flame until the skins blister, crack and blacken. This technique replicates the traditional method of blackening them over open fires or grills. A hand held butane torch can also be used. Do not over-blacken, or a bitter taste will result. This technique removes the excess moisture from the tomatoes. It is most common to toast and rehydrate dried chiles before puréeing them in Southwestern cuisine. Stem and seed the dried chiles, and dry-roast in a single layer in dry cast-iron skillet, or on a baking sheet in a 250 degree oven, for 2 to 3 minutes. Shake occasionally and do not allow to burn or blacken or the chiles will taste bitter. Transfer to a bowl and add enough hot water just to cover. Let stand for about 20 minutes until they are rehydrated and soft. In a food processor or blender, purée 2 of the tomatoes, the chipotle chile, and ginger. Add the remaining tomato and all of the other ingredients and pulse just enough to create a roughly blended mixture. Be sure to leave the salsa somewhat chunky. Variation: Substitute 1 additional teaspoon Howlin' Hot Sauce or other yellow Scotch bonnet sauce or 1 teaspoon habanero chile sauce for the chipotle chile. Serving suggestions: With grilled tuna, swordfish, pork, or duck. Toast the chiles and rehydrate them in 1 quart of warm water with the sun-dried tomatoes. Drain the chiles and tomatoes, reserving 1 cup of the water, and transfer to a blender. If it is not bitter, add the reserved chile water; otherwise, add 1 cup of plain water. Add all the remaining ingredients and puree. Serve with grilled chicken or turkey. Toast the pumpkin seeds and let cool. Heat the canola oil in a skillet and when almost smoking, turn the poblanos in the hot oil for 45 seconds until blistered but not blackened. Transfer to a bowl, cover with plastic wrap, and let steam for 10 minutes. Peel and seed the poblanos, place in a food processor with the toasted pumpkin seeds, and chop for 1 minute. Add the cilantro and blend for 1 minute. Add the olive oil, lime juice, and salt, and run for 30 seconds longer, or until smooth. Serving suggestions: With pasta or rabbit. Serve on crisp tostadas, as a salad, or as a side. Remove stems and seeds from the chiles. Dry roast the chiles in a 250°F oven for 3 to 4 minutes. Add the roasted chiles to water that has been heated to just below boiling. Allow them to sit for 20 minutes or until soft. Drain, reserving the liquid. Puree the roasted, re-hydrated chiles. Blacken the tomatoes in a skillet or under a broiler (about 5 minutes). Saute the onion in the oil over low heat until browned. Put chiles in a blender and add blackened tomatoes, onion, garlic, cumin, oregano, and salt. Add 1 cup of the reserved Chile soaking water (taste the Chile soaking water before adding it, if it is not bitter, use it, if it is bitter, use plain water or chicken stock instead). Puree to a smooth paste, adding more Chile water, water, or chicken stock if necessary. Add oil or lard to a high-sided pan, and heat until almost smoking. Re-fry sauce at a sizzle for 3 to 5 minutes, stirring continuously. Do not allow sauce to get too thick; add water if necessary. Sauce can be kept for up to 1 week in the refrigerator. Serving suggestions: On top of eggs, as a soup garnish (for tomato soup in particular), or with pasta. Best to use an alder dry-smoked salmon. Serve leftovers over pasta. Preheat oven to 350F. Place the bananas (in their skins) on a cookie sheet or in a baking pan and roast for 30 minutes; the skins will turn dark brown. Let the bananas cool. Peel dice and place in mixing bowl. Add the dark rum, vanilla, maple syrup, brown sugar and macadamia nuts; fold together. Sprinkle with 2 or 3 more chopped macadamia nuts over the top. Serve with tuna or pork. Heat the cider in a saucepan, add the ground green chiles, and over high heat, reduce the liquid by half. Lower the heat to medium-high, add the apples, and cook until tender, about 10 minutes. Transfer to a food processor or blender, add the pine nuts and maple syrup, and pulse together; the mixture should be a little chunky. Remove tails of shrimp if still attached. Heat the oil in a pan and add garlic and ginger and sauté for 2 minutes, until browned. Add the shrimp and salt and sauté for 2 minutes longer. Add the orange juice and vinegar and cook for 30 seconds longer while stirring. Transfer to a glass bowl and add remaining ingredients and mix well. Makes a great dip for chips or a topping for grilled fish such as halibut or sea bass. Or use with pasta. Heat the olive oil in a saute pan or skillet and sear the scallops over high heat for 2 minutes, until cooked through. Slice the scallops in half and then each half into quarters, and transfer to a mixing bowl. Rinse the chipotles with water and julienne into thin strips. 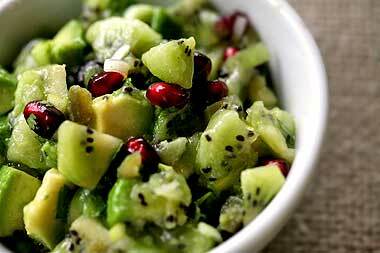 Add to the mixing bowl together with the tomatoes, avocado, cucumber, and lime juice, and thoroughly combine. Place the mussels in a large saucepan with the garlic, wine, water, pepper, and bay leaf, and bring to a boil. Steam, covered, for 5 minutes until the mussels open (discard any that do not open). Remove the mussel meat from the shells and transfer to a mixing bowl. Reduce the cooking liquid to 1/2 cup and set aside. Blanch the diced potato in 1 quart boiling sailed water for 8 to 10 minutes until tender. Drain in a sieve or strainer, shock under cold running water, and transfer to the mixing bowl. Blanch the leek in 2 cups boiling water for 2 to 3 minutes, until al dente and transfer to the mixing bowl. Place the reserved cooking liquid in a blender and blend with the olive oil and lime juice. Add to the mixing bowl with the parsley, and thoroughly combine. Serve as a brunch or with pasta. Puree all the ingredients together in a food processor or blender. Serving suggestions: With shrimp or chicken.